My mother, Phyllis, was one of the first female blackjack dealers in Nevada. She and her sister, Clare, worked for Harold’s Club in Reno in the early 1940s. General Manager Raymond “Pappy” Smith was the first Nevada casino owner to hire female blackjack dealers to work in the clubs. His reasoning was if casinos hired female dealers, more GIs from the Reno Army Airbase would be attracted to the clubs. In those days, casinos used composition chips as much as they do today. However, they also used the common medium of exchange in Nevada at that time, the silver dollar, for many of their table games. Winnings were paid out in silver dollars and tips and even wages were sometimes paid that way. When I started school in Sparks, hot lunch for the week was 20 cents per day or $1 for the whole week. Every Monday, Mom, being a blackjack dealer, would give me one silver dollar for my weekly lunch. I soon noticed in addition to the Peace Dollars minted from 1921 through 1935, many were the much older Morgan dollars minted off and on from 1878 through 1904 and again in 1921. I was fascinated so many of the silver dollars given to me for lunch money were made back in the 1800s. One day, I noticed to my surprise one of the silver dollars she gave me was a Carson City silver dollar dated 1890. I went all week without lunch and kept the old silver dollar. I can honestly say I still have the first dollar I ever saved. Later in my illustrious career, I worked on our family farm on Glendale Road in Sparks, weeding onions and working in the potato fields. My uncle, Chester, was the bookkeeper and paymaster for the farm/ranch. At that time, wages for farm laborers was 50 cents per hour. At the end of each workday, boys I went to school with and I, along with other laborers, were paid for our work. Uncle Chester stood at the edge of the field with a cowboy hat full of silver dollars. As each worker passed by, he gave each one of us five silver dollars for the 10 hours of work. Now, before you think we were getting ripped off back in those days, you should consider this amazing fact. If I was paid those same five silver dollars today, each one would be worth approximately $20. This means the wages for one day of work would now be $100. I could almost live on that. 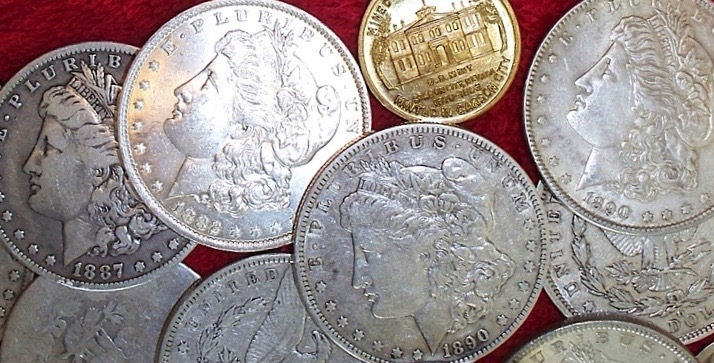 In 1999, my crew and I uncovered the amazing stash of coin dies that had been buried in the ground at the old Carson City Mint building, now the Nevada State Museum. More than 500 of the rusty dies were recovered and many of them that have been cleaned are now on display at the museum. I honestly believe that were it not for my fascination for silver dollars, the buried coin dies wouldn’t have been noticed. If you visit the Nevada State Museum, you can see the original Coin Press No. 1 that was used to mint many of the Carson City coins and also the amazing collection of one of each of nearly all the Carson City gold and silver coins ever made. On the cover of my book, Chronicles of the Comstock, are color photos of several of my Carson City silver dollars, including the unusual Trade Dollars that were coined at the Carson City Branch Mint. 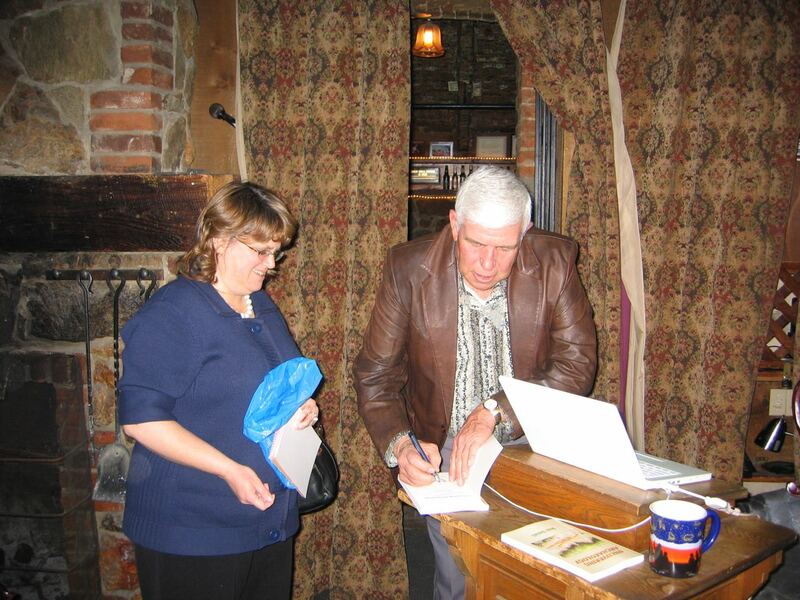 The book has many stories about the Comstock era and the historic old mint. The impact to wildlife is a major concern when wildfires strike. On a recent trip through areas of Northern Nevada rangeland that have been burned in fires during the past 3 years, I have made a few casual, unscientific observations. The purpose of my trip was hunting and camping in portions of Elko and Humboldt counties that had been heavily burned in recent range fires. I had hunted and camped in the same areas on different occasions in years before the fire damage had occurred and was saddened to see the destruction of the natural landscape that has occurred in recent years. The most obvious damage occurred to the vegetation in the region where thousands of acres of rangeland and wildlife habitat have been lost. The Bureau of Land Management and other government agencies such as Department of Wildlife and U.S. Forest Service have been cooperating to revegetate as much of the area as possible. The methods being used are both aerial seeding with native grasses from aircraft and on-ground seeding in the flatter areas with mechanical grain drills. Seeding efforts are never a perfect solution for such disasters, but it is better than no action at all. Seeding in the high desert country depends on precipitation to be successful and water is a scarce commodity in the desert. If the rains come too fast before plants take root, heavy erosion occurs. The impact to wildlife is the next major concern, since the native species that do survive the fires must relocate to places that were not damaged that are suitable for their survival. We cannot estimate how many birds and mammals simply do not survive this relocation. Most deer, pronghorn antelope, sage grouse, quail, partridge, coyotes, bobcats and other animals were obviously impacted by the fires. Until habitat for these creatures grows back, the range cannot support them. I estimate ten to twenty years before the range recovers even with revegetation efforts. The extent of the destruction must be seen to be believed. When we observed the revegetation efforts in the older burned areas, I noticed the main seed used was the grass seed mix, probably crested wheat grass that has filled in quite well. The areas where the grasses had filled back in had numerous pronghorn antelope and coyotes, but no deer. Antelope feed quite well on the grasses and other small plants in the seed mixes. Deer, however, are herbivores that require vegetation that requires a longer period of time to mature in order to sustain a herd. 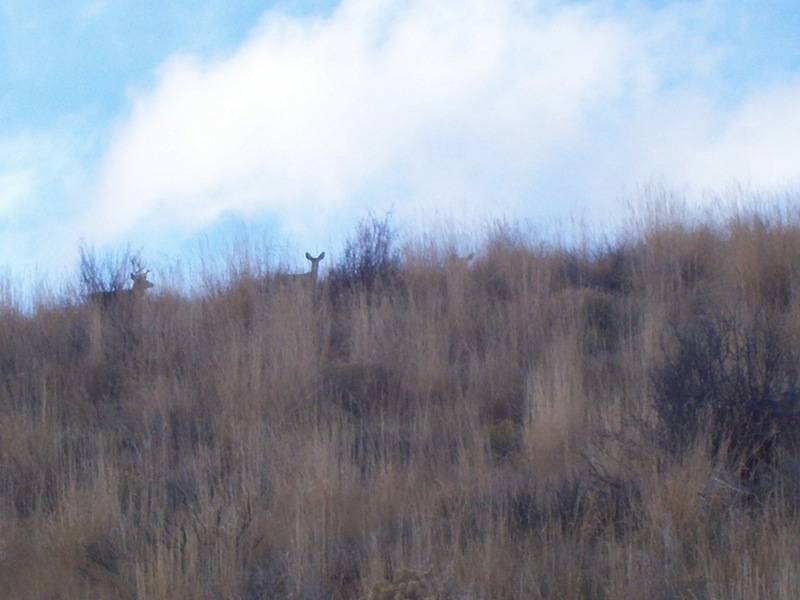 These animals eat sagebrush, buck brush, bitter brush and others that require several years to mature to the point they will sustain many deer. Sage grouse are the most affected by the fires. Sage hen habitat throughout the Great Basin has disappeared drastically from fire damage and human development in recent years. These creatures eat primarily sagebrush (artemisia) and little else. I have noticed that the sagebrush that has begun to grow in the reseeded areas does not look the same as the native sage brush. I have a fear that if it is not exactly the same as the native species, the birds will not eat it. The other problem I see with the sage brush coming up in the reseeded areas is that the individual plants are widely scattered. In original sage brush habitat, the plants are usually all sagebrush, not a mixture. When young Samuel Clemens first came to the Nevada Territory in 1861, he thought he would be given an easy office job assisting his brother, Orion, who had been named by President Lincoln to be the first and only Territorial Secretary for Nevada. When young Sam learned there was no money available to pay an assistant for his brother, he decided to search for some other means of earning an easy living. He noticed that there was a growing demand for lumber and firewood due to the booming mining industry in the region. 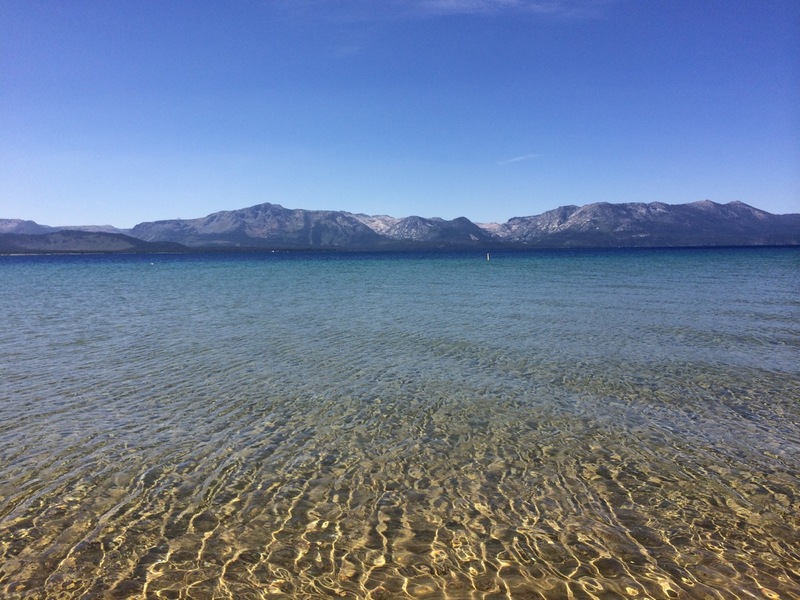 In September, 1861, Sam and a friend named John Kinney decided to hike to Lake Tahoe to stake out a timber claim in hopes of becoming timber barons. In 1874, after Sam became famous as Mark Twain, he wrote his account of this adventure in Roughing It. At the time of Twain’s lumber baron venture, Lake Tahoe was known as Lake Bigler. Very few of the landmarks Twain described in the book had names we would recognize today. There were only descriptions of topographic features and some highly exaggerated estimations of mountain elevations. Also, Twain was writing from memory about things that had happened thirteen years previously. Several subsequent researchers have attempted to determine the route taken by Twain and Kinney to the lumber camp and determine its exact location. As usually happens with Twain’s writing, historical accuracy is often sacrificed for humor and the creation of an interesting story. Having worked for over eight years at Glenbrook and navigated my own boat along the east and north shores of Lake Tahoe, I feel I can easily trace the route taken and where the camp was located by the descriptions given in the Roughing It account. My interpretation places the camp on the east shore of the lake, and other authors surmise it was on the north shore. Regardless, the story remains basically the same. The wannabe timber barons spent the night at the Nye camp and helped themselves to some supplies they found stashed away in storage. They then rowed the skiff another three miles north to a place now known as Secret Harbor and set up a camp of their own. Twain and Kinney set about marking the perimeter of an area of 300 acres and pinning “Notices” on trees. They cut down six trees and let them fall along the boundary to indicate the extent of the claim. Since law required a cabin be built, they constructed a brush lean-to as a shelter. In Twain’s own words, he describes how he avoided any strenuous activity, delegating the rowing of the skiff and anything requiring any effort to Kinney. The remainder of their stay at the camp was spent loafing, playing cards, fishing and enjoying the serene beauty of Lake Tahoe. They floated in the skiff and admired the fishes and underwater features through the pristine crystal clear waters that made them feel as if they were floating in a balloon. Their most strenuous activities involved smoking their pipes, reading dog-eared novels and occasionally rowing over to the camp of the Irish Brigade to raid their cache of supplies. Upon return from one of their “shopping” trips, Mark Twain built a fire for their evening meal while John carried the provisions to the lean-to house. Mark went back to the skiff to fetch the frying pan when John shouted that the fire had escaped the fire pit into the dry pine needles and brush. Within a few minutes the escaping camp fire consumed the lean-to house, the provisions and all the furnishings of their beautiful lakeside home. It raged through the brush, slash and pine needles and began consuming some of the huge old dead standing trees. And so, after just two or three weeks of “working their claim” on the shores of Lake Tahoe, the timber baron phase of Twain’s experience in Nevada Territory came to a flaming end. The pair never sold a single log and they never even filed the timber claim at the recorder’s office. Twain and Kinney returned to Carson City the next day after eating up the rest of the provisions from the stash of the Irish Brigade. Upon their return, Twain told the Brigade about raiding their supplies and asked forgiveness. It was granted, only upon payment of damages. Since operating a logging and timber operation did not seem to be a vocation suited to Twain’s aptitude, he contemplated something more appropriate, such as prospecting, for example. Sooner or later, he would find his niche in the History of the Comstock and America. The following story was told to me by Robert Laxalt shortly before he passed away several years ago. At the time I was doing some work on his irrigation system at his home in Washoe Valley. Robert’s wife, Joyce, told me Robert wanted to meet with me because he knew I had written a book and Robert always was interested in writers and writing. He was very ill at the time, but we had a delightful conversation. Robert asked if I was related to a Bill Cassinelli. I told him Bill was a cousin of my father, Raymond. He then told me that Bill Cassinelli, Paul Laxalt and another fellow I knew named Leon Etchemendy all had served in World War II together. Paul Laxalt was Robert’s brother. Leon Etchemendy worked at the Nevada Department of Transportation at the same time I worked there in the 1980s. Both Paul and Leon were from Carson City. Bill had been born and grew up in Reno. Somehow, the three of them ended up in the Aleutian Islands under attack by the Japanese. Apparently, the three men had never met before. As they introduced themselves to each other, they were surprised to learn that they all came from western Nevada. The time came when Bill Cassinelli took a hit from a Japanese shell, which took off one leg. With the assistance of Laxalt and Etchemendy, Bill was taken out to a medical facility where they were able to save his life, but not the leg. Bill was a frequent visitor to the ranch where I grew up in Sparks. Before the war, he had been an avid baseball player. After his return, he continued to be a fan of the game. We often attended games at the old Threckels Ballfield on East Fourth Street in Reno in the 1940s. Bill and his wife, Clara, a cousin of my grandmother, Edith Cassinelli, moved to Stockton, Calif. Paul Laxalt later became governor of the state of Nevada. Leon Etchemendy and Bill remained close friends. Leon and I both worked at the Department of Transportation in Carson City during the 1970s and 1980s. He remarked how unusual it had been that two Bascos and an Italian from the same area just happened to end up in the same place at the same time during the war. Arrow Shaft Straightening Stone, on display at the Carson Valley Museum and Cultural Center. Many, many years ago, I was looking at home lots being cleared in a new residential area along the Carson River southeast of Carson City. As I walked through the sagebrush across a rather steep slope, I noticed a smooth, fist-sized cobble on the ground that seemed to be out of place for the area when compared to the rough, broken natural stones that littered the hillside. Being somewhat of a rockhound and an amateur archaeologist, I picked up the stone and examined it more closely. I immediately recognized that the rock had been worked by the hands of man, and at first I thought it was a mano. 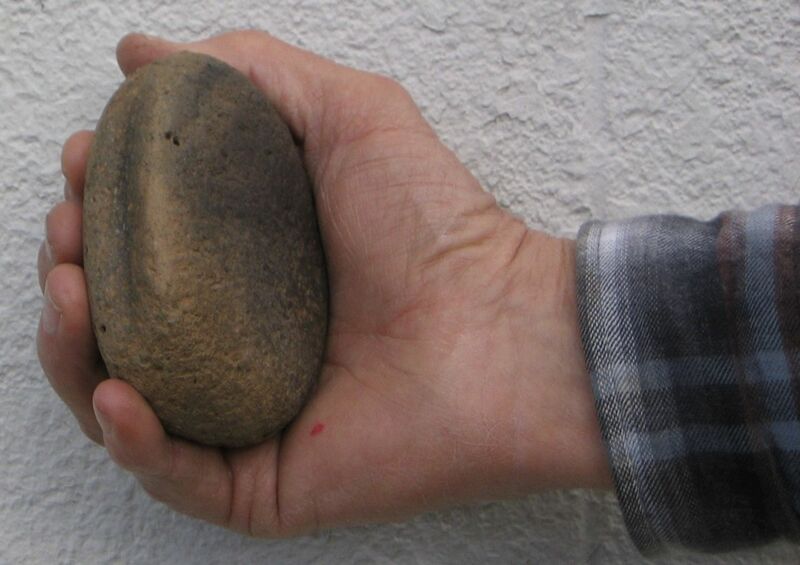 For those of you who may not know, a mano is a flat, smooth stone used by the American Indians with a larger flat or slightly concave stone for the purpose of grinding or hulling nuts, seeds or grain. Upon closer examination, however, I determined that the stone was not the common mano, which really is quite abundant in the fields and places where prehistoric Indians were known to have lived. This stone differed from a mano in several distinct ways. These differences enabled me to identify the item as an arrow-shaft straightener rather than a common mano. Carved or worn into the edge of the stone was a distinct groove that was highly polished. The groove was about 1/4” wide and 3” long. The stone was flat, and both sides were blackened from having been heated in a fire. During the process of making arrows, the wooden shaft must be perfectly straight in order for the arrow to fly straight and true for the desired accuracy. This was accomplished by using a heated stone to rub along the arrow shaft to work out the natural irregularities in the wood. The user held the hot stone with a piece of leather and rubbed it back and forth on the convex side until the arrow became straight. The hot stone also helped to smooth and polish the arrow shaft. 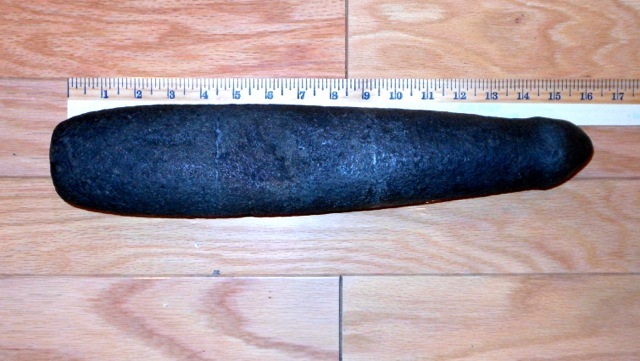 I since have seen other specimens of shaft straighteners from different areas around Carson City, Virginia City and Como almost identical to the specimen I found. The straightener obviously had been a tool that was widely used by the local Indians. This is just one example of the rescue of an unusual artifact from a construction site before it was buried by heavy equipment or hauled away during construction. I donated this specimen to the Carson Valley Museum and Cultural Center in Gardnerville, Nevada, where it remains on display with hundreds of other Indian artifacts in the Cassinelli-Perino Artifact Collection. I have written a book about this and the other artifacts in the collection. The title is Preserving Traces of the Great Basin Indians. 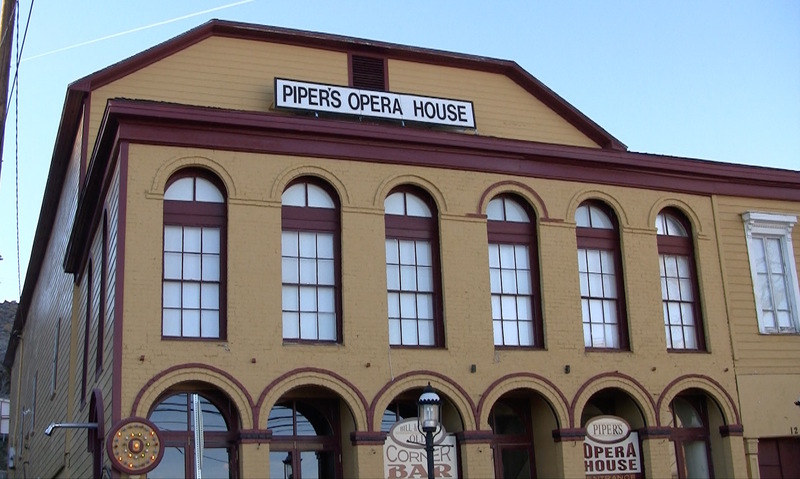 It is available at the Mark Twain Bookstore and the Gold Hill Hotel bookstore. There is a delightfully humorous story in the last chapter that tells how the local Indians made their arrows, including how the arrow straighteners were used. The book contains hundreds of illustrations and descriptions of arrowheads, tools and other artifacts found in western Nevada. 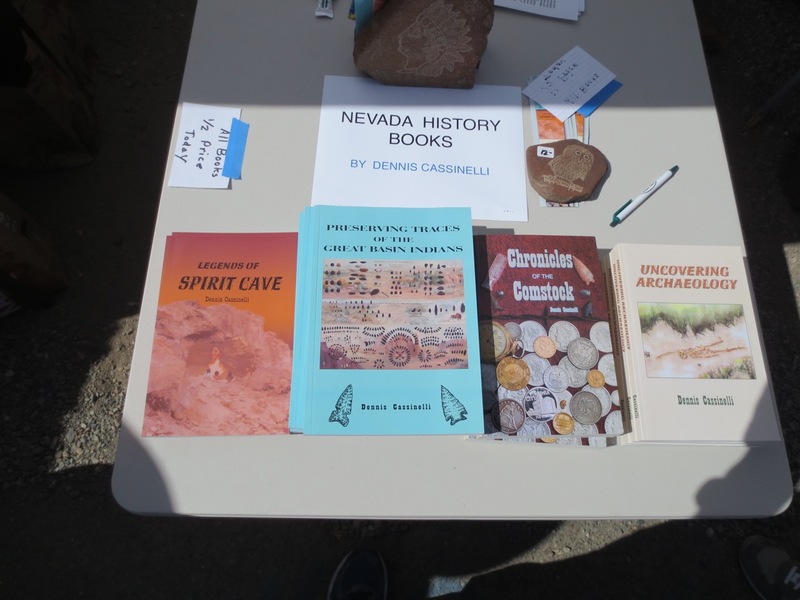 Every spring, I do a lecture about prehistoric Nevada at the Gold Hill Hotel, where I display and discuss this and many other Great Basin Indian artifacts. I hope to see you there. Dennis discusses American Indian stone tools, and he illustrates his lecture with actual display boards from the Cassinelli-Perino Artifact Collection. 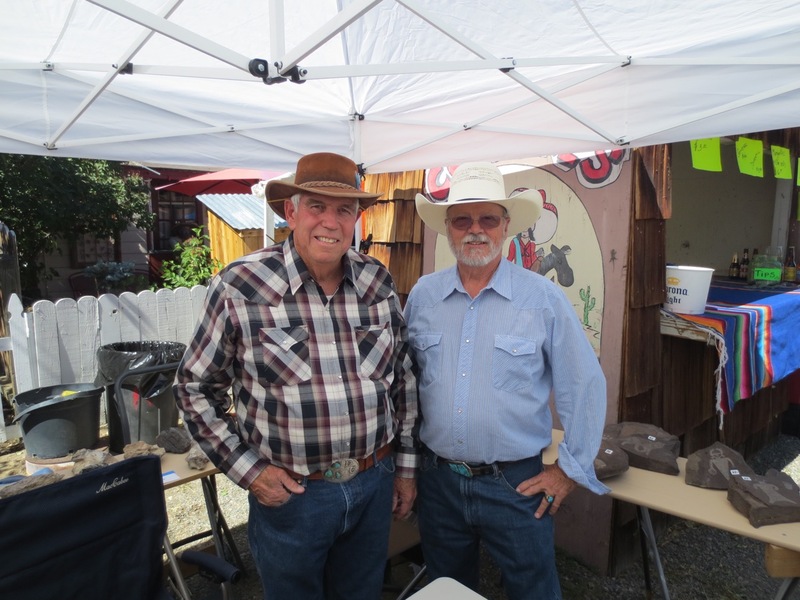 He also talks about the discovery of the Spirit Cave Man mummy, as well as how he helped unearth a cache of rare coin dies at the Carson City Museum, formerly the Carson City Mint. 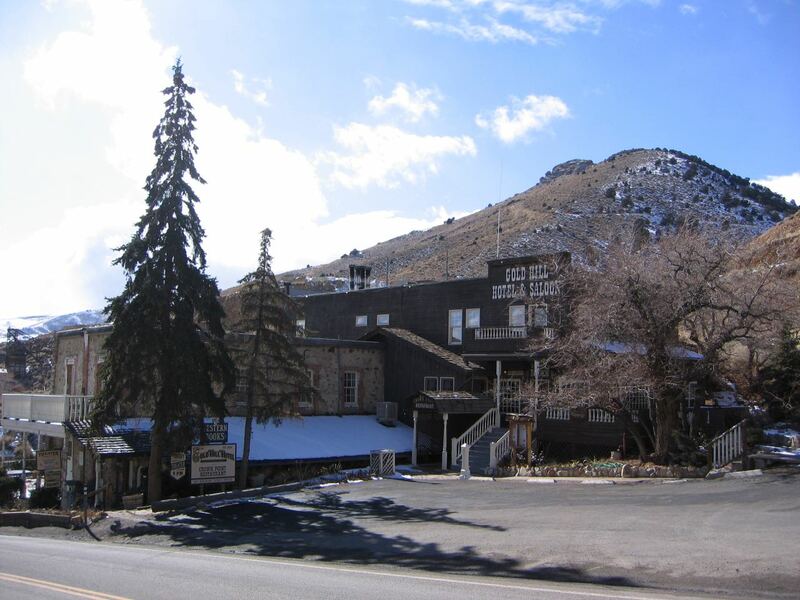 In the days when the Virginia and Truckee Railroad traveled between Virginia City and Carson City, there was one important station along the way known as Moundhouse. Located about halfway between the two cities, Moundhouse also was the terminus point for the narrow-gauge Carson and Colorado Railroad. The Moundhouse Station was quite substantial, having numerous warehouses, loading and unloading areas, and an extensive train yard. It was situated just north of present U.S. Highway 50 and east of Redrock Road. The railroad yard at Moundhouse was abandoned in 1939. The tracks were taken up and the buildings gradually disappeared. By the 1980s, commercial development completely covered the site. The shop and equipment yard for my family business, Cassinelli Landscaping and Construction, are now located on the site of the former Moundhouse Station. This is now one of Nevada’s most famous ranching districts, being located near the Moonlite Bunny Ranch, the Sagebrush Ranch, the Kit Kat Ranch and the Bunny Ranch II. All of these beautiful ranches are visible from the windows of our offices. Due to the extensive commercial development that has occurred in recent years, the rebuilt Virginia and Truckee Railroad will not be routed where the original station once stood. The new route will be about a half mile west of the original site near where the Lyon County/Carson City line crosses U.S. Highway 50. Being an amateur archaeologist, I have searched the area extensively looking for some remnants of the old Moundhouse Station. The area is so changed, there is only one thing that marks the site today. Just across the driveway from our office stands a gnarled old pinion tree. Beneath the tree lies a grave surrounded by an ancient wooden picket fence. 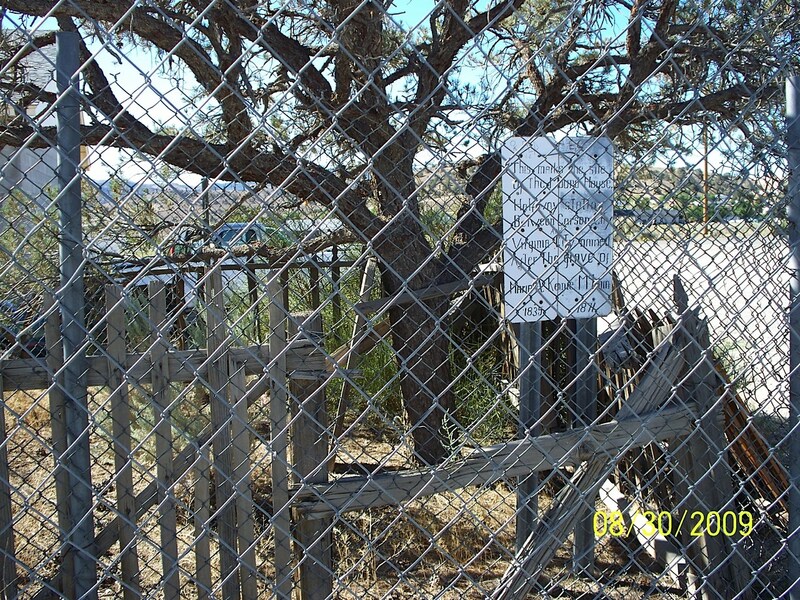 The fence was so old and fallen down that someone had enclosed the gravesite with a modern chain-link fence. A weathered wooden grave marker, though illegible, leans precariously against the pinion tree. 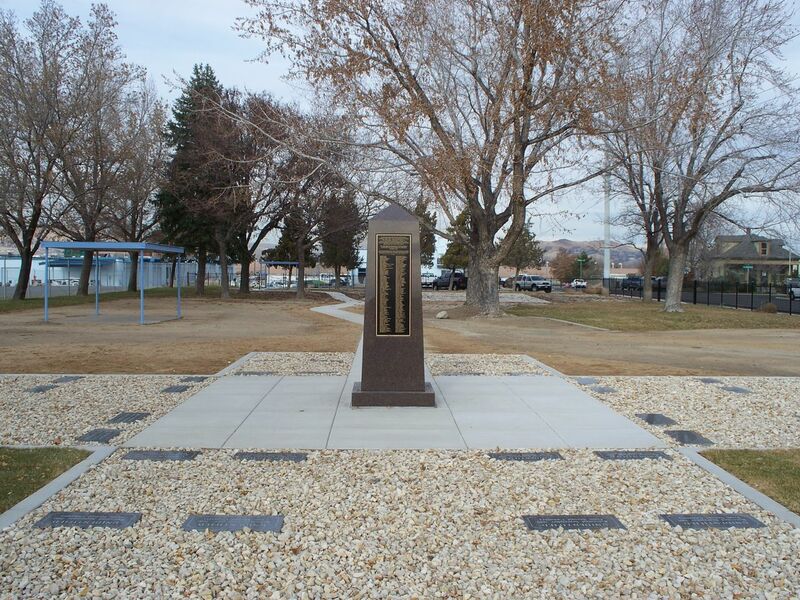 A few years ago, I told the historian at the Nevada State Railroad Museum about the grave. She was able to locate some descendants of Ms. Mclain. The relatives lived out-of-state, so we took pictures of the gravesite to send to them. My crew and I respectfully tend to the grave, and on dry years we drag the hose out and give the gnarled old pinion tree a drink. Hopefully, those who follow us will continue to preserve and protect this one last remnant of the original railroad station at Moundhouse. This article originally appeared in the Comstock Chronicle, Virginia City, Nev. I hope the title of my article does not prompt some local nimrods to apply to the Nevada Department of Wildlife for a mammoth tag. On the other hand, I can tell you with some authority that at one time, mammoth and other giant animals left over from the Pleistocene Age were hunted and eaten by some of the earliest hunters to enter the areas around the Great Basin. This mammoth tooth is on permanent display at the Carson Valley Museum and Cultural Center in Gardnerville, Nevada, as part of the Cassinelli-Perino Artifact Collection. In my younger years, I was an avid hunter of deer, antelope and upland game found in the deserts and mountains of the Great Basin. In those days, a hunting license cost $5, and a deer tag could be purchased over the counter for $7.50. Those days are long gone, but I still enjoy getting out in the hills and letting the elusive Chukar partridge make a complete fool of me. I honestly can say that I have hunted one native Nevada animal that most hunters never even knew existed here. It may come as a shock to some people living in or visiting our fair state to learn that in years past, the slopes of the mountains and valleys of Nevada were grazed by herds of elephants, more properly known as mammoths. Imagine, if you can, driving across the desert hills near Winnemucca and spotting a family of elephants browsing along the banks of the Humboldt River. My first encounter of this beast was in the early 1960s when I was a field engineer for the Nevada Highway Department. I was working in the Winnemucca District Office when Jerry Fitch, the local resident engineer, invited me to go with him to the Rose Creek Gravel Pit about 10 miles west of town where an equipment operator had just uncovered a huge tusk in the floor of the pit. 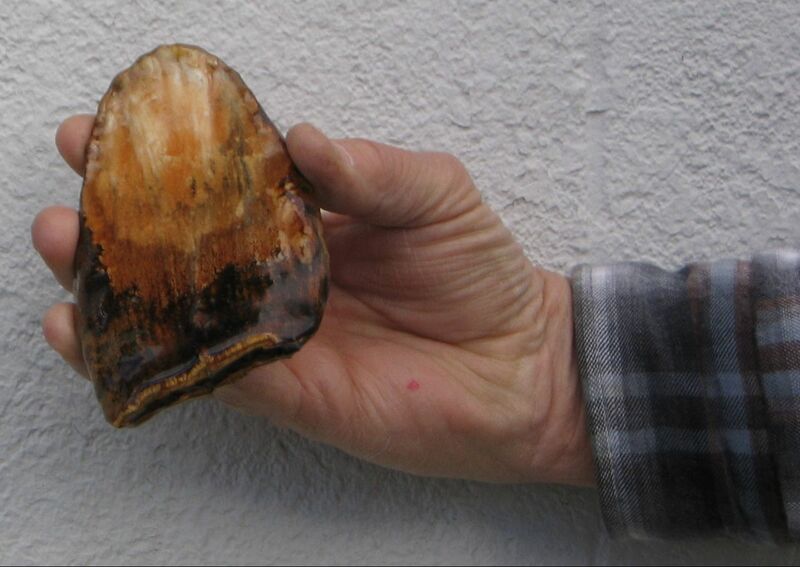 The blade of the scraper had skimmed the tusk, revealing the distinctive, nearly full curl of a mature mammoth tusk fossil. Fitch notified Donald Tuohy at the Nevada State Museum of the discovery. Tuohy came out and spent several days hand-excavating the tusk and encasing it in a plaster-of-Paris cast so it could be transported without breaking. The tusk was taken to the museum storage facility in Carson City. I recently asked archaeologist Eugene Hatouri whatever became of the tusk. He told me it was still in storage and never had been removed from the plaster cast. I have seen other museum displays where such tusks were cleaned and polished so visitors could see, touch and feel the warmth and grain of the beautiful fossilized ivory. It almost gives a person a connection to the original animal to be able to touch and feel this polished ivory. The Nevada State Museum has a display of a huge Imperial Mammoth skeleton that was found in the Black Rock Desert. The display is made of plastic castings of the original bones, as the originals are so heavy. I would challenge the staff at the museum to clean and polish one of the original ivory tusks for people to see and touch. The experience is unforgettable. Many mammoth sites have been discovered in the Black Rock Desert. Some of the sites had Clovis points nearby, indicating early hunters may have hunted or killed the animals. Clovis points are the stone lance tips that were used by early man for hunting mammoth before the creatures went extinct about 10,000 years ago. It is well-known that Early Man entered the Great Basin more than 10,000 years ago. These people were hunter-gatherers who roamed the region in search of food. It’s also known that a few mammoths still roamed the region at the same time. Many mammoth remains from that time period have been uncovered. Many human hunting camps have been found from that same time. Clovis points have been found at some of these hunting camps. In other areas, Clovis points were used exclusively for mammoth hunting. By simple logic, we can conclude that the hunters were engaged in hunting the few remaining pachyderms. I replied that I did not know what they were, but that there sure weren’t any live ones running around. Amy told me the fossils I had found were the teeth and jawbone of a young mammoth. She sent a paleontologist out to investigate further, but no more remains were found. She put the bag of mammoth teeth into storage with other such samples — except for one tooth, which I kept. 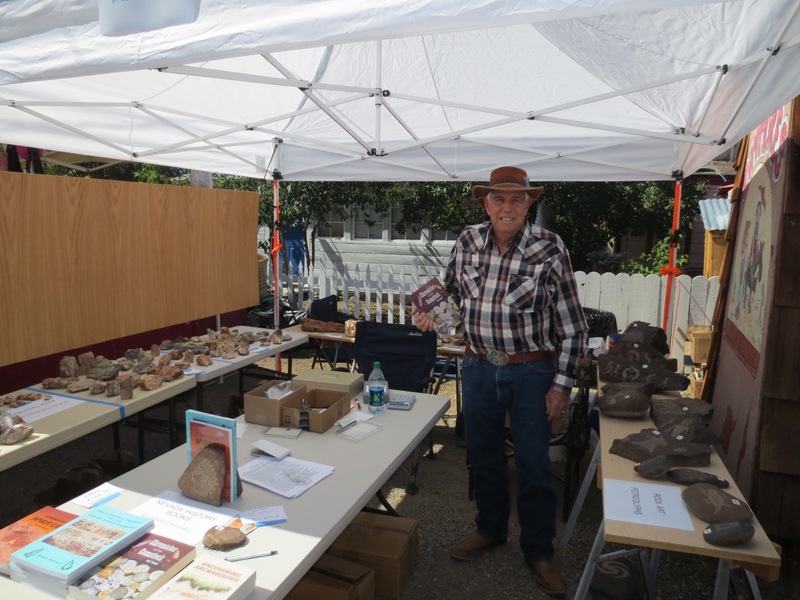 I coated the crumbling fossil with resin to protect it and donated it to the Carson Valley Museum and Cultural Center, where it is on display with a collection of Indian artifacts I had given to them. In Douglas County, there have been some excavations of mastodon bones in the Pine Nut Mountains. The Bureau of Land Management is limiting off-road vehicular travel into the Ruhenstroth area to protect the fossils in this region. If you would like to read about how Early Man hunted and processed mammoth meat 10,000 years ago, I suggest you get a copy of a book I have written titled Legends of Spirit Cave. It is available at the Gold Hill Hotel bookstore near Virginia City. The book is a prehistoric novel that shows how people lived in this area near the end of the Pleistocene Age about 10,000 years ago, including how they hunted and killed the last mammoth. (The first chapter of the book, titled “The Last Mammoth,” can be read in its entirety right here.) Although the book is fiction, the way the people lived, the foods they ate, the medicines they used and the ways they interacted with one another all is researched and factual information. It is a fun book to read, and it really takes you back to the time when ancient hunters of Nevada pursued the mighty mammoth with nothing more than sharpened sticks and stones. Gold was first discovered in 1849 by Abner Blackburn and several other placer miners at the mouth of Gold Canyon where it empties into the Carson River at Dayton. Shortly after the discovery, an influx of prospectors, miners and opportunists began working its way up Gold Canyon in pursuit of the elusive yellow dust. It would be another 10 years before silver would be identified as the most amazing mineral discovery of the century at the upper end of Gold Canyon. Enterprising Spafford Hall saw an opportunity to make his fortune catering to the needs of the local miners and travelers passing through to the “real” gold fields in California. Hall constructed a substantial log store to become known as Hall’s Station. This was the first business established in what later would become known as Dayton, and Hall was the first permanent settler. To provide entertainment to the miners, ranchers and employees at the station, Hall decided to throw Nevada’s first New Year’s Eve dance at the station on Dec. 31, l853. He invited a total of about 150 men from a radius of about 50 miles. Nine of the 12 women then living in this remote outpost of western Utah Territory showed up for the bash. I’m sure there was not a wallflower among them. They ranged in age from little girls to grandmothers. 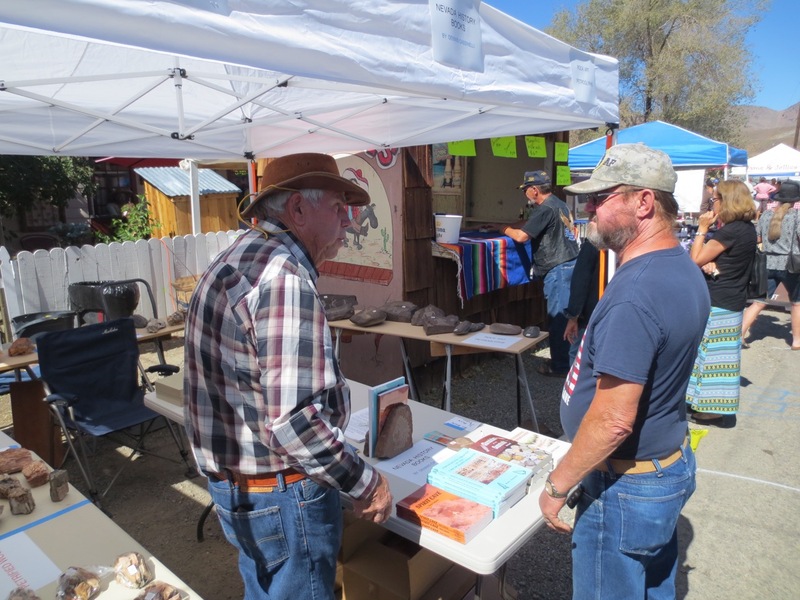 Miners, cowboys and ranchers waited their turn for a chance to dance with the ladies. They danced on the rough log floor to the music of a makeshift orchestra playing “Oh Suzanna,” Virginia reels and other popular ditties. The affair lasted until the wee hours of the morning. When at last the party broke up and the revelers went out to get their horses for the long ride home, they found most of the horses were gone. It seemed that sometime during the fandango, a band of Washoe Indians drove off the horses to a place near the present site of Moundhouse. There, the Indians, who were fond of fresh horsemeat, were having their own New Year’s Eve party consisting of a horesmeat barbecue. A search was begun by the hungover partygoers in an attempt to track down the missing animals. They set out on foot in the cold January air with headaches and a chill in their bones with a bitter contempt for the Washoe horse-nappers. It wasn’t until late the next afternoon that most of the horses were recovered. Two of the animals were never recovered and were considered eaten. Late New Year’s Day 1854, the participants of Nevada’s first recorded dance made their way home from the most memorable dance party they likely ever were to attend. Later that year, Spafford Hall was severely injured in a hunting accident and sold the station to an employee, James McMartin. Major Ormsby bought the station sometime between 1854 and 1860. The title was still in his name when he was killed in the first battle of the Pyramid Lake Indian War. The site of Hall’s Station has been destroyed by the huge borrow pit at the mouth of Gold Canyon, which rivals in size to the pit at the upper end of the canyon at Gold Hill. Perhaps someday, there may be a re-enactment of the events of the first dance ever recorded in what was to become Nevada. Because Hall’s Station no longer exists, it may be appropriate to hold the event at my office in Moundhouse. After all, some of the original festivities ended up in Moundhouse anyway. 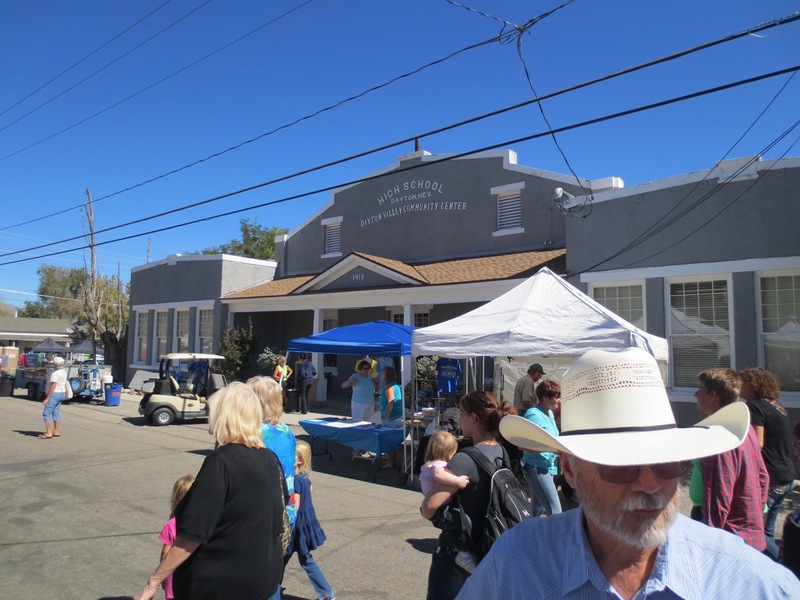 It seems to me that a community that holds events such as the World Championship Outhouse Races, the Camel Races, Bed Races, the Mountain Oyster Cookoff and other unusual events just might consider a celebration of Nevada’s first dance and even the horse barbecue that topped off the event. Never mind — on second thought, I don’t think so. How did the American Indians cope with winter weather? This column is dedicated to Angela Mann, editor of the Comstock Chronicle, a weekly newspaper serving Virginia City and outlying areas. She posed to me the question of how the Indians who inhabited the Great Basin region hundreds and thousands of years ago were able to cope with the severe winters we have in Western Nevada. She wondered about the Indians of old and where they went to hunker down when these unpredictable winter storms set in. People who live here today and complain when the Nevada Department of Transportation hasn’t plowed the road in time or when their heating bills are too high should look back in time a few hundred years to see just how winter weather affected the earliest inhabitants, the Indians. The first people to enter our region came here at least 12,000 years ago, just after the last Ice Age. They had no horses or other means of transportation except walking. They were hunters and gatherers who lived off whatever they were able to forage from the land. Over the years, they were able to develop a seasonal traveling lifestyle that took them to the best places to hunt and fish, and to gather berries, roots and nuts for their sustenance. As winter approached, they knew they had to have a stockpile of preserved foods and a relatively sheltered place to “hunker down” when the really severe weather set in. Because these people lived a nomadic existence, few of them had any permanent home. They usually returned to a familiar place each winter to seek shelter. Some of the favorite places used by the Washoe, Paiute and Shoshone Indians and their predecessors to spend the winter were near the many natural hot springs found throughout the region. Most of these are located in a lower elevation than the surrounding mountains, and archaeological evidence shows that they were used extensively by the Indians. Simple shelters were set up using sagebrush, willows and stone. Food was placed in baskets and stored in grass-lined pits. 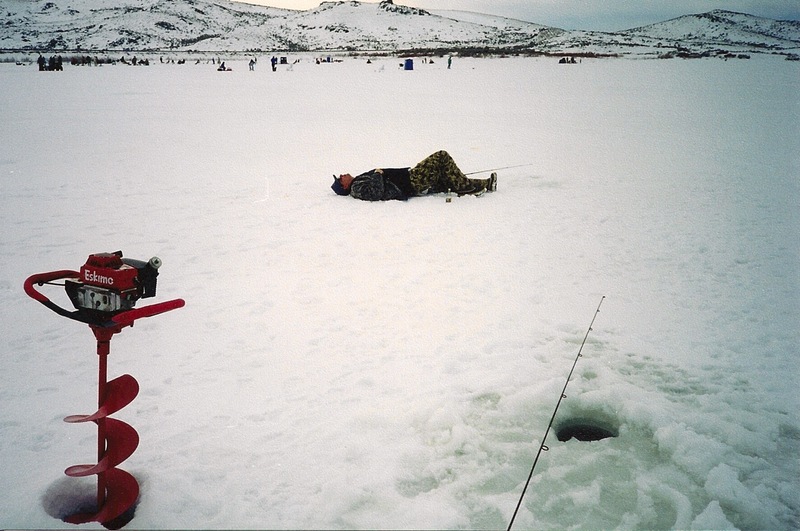 Even in winter, some fresh fish, small game and waterfowl could be hunted. Another favorite place for winter habitation was the thousands of small caves and rock shelters that could be found throughout Nevada. Whenever you see a cave or rock shelter in the nearby mountains, chances are it was used for human habitation at some time in the distant past. These caves include Lovelock Cave, Hidden Cave, Spirit Cave and hundreds of others found along the shore of ancient Winnemucca Lake and in the Grimes Point area just east of Fallon. The openings of these shelters often were covered with a wall of brush to keep the wind out. Small fires helped to break the chill, but the smoke was almost intolerable. Many of these caves have been found with well-preserved weapons, tools, artifacts, food-storage pits and even human remains in a mummified condition. The people suffered greatly when the extreme cold weather set upon them. Frostbite was a common occurrence. Living in cramped quarters with nothing to break the chill but a smoky sagebrush fire and nothing to sleep on but a bed of branches covered with matting or hides surely made the long winter months miserable. 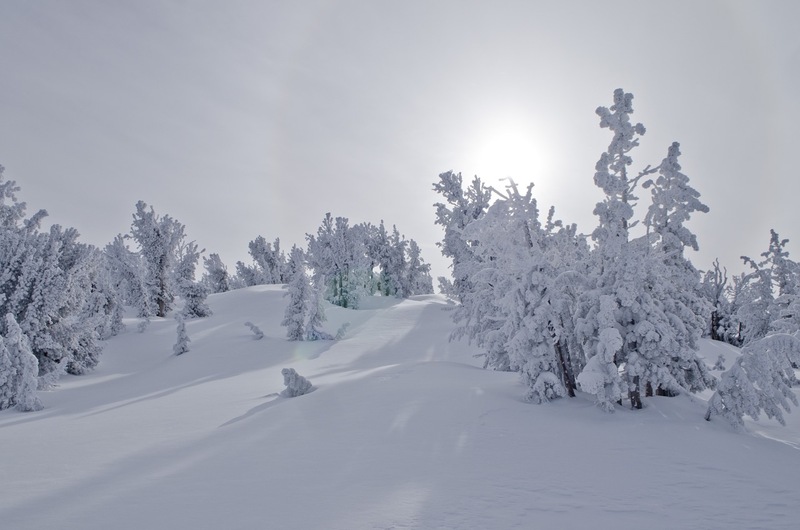 The most severe condition happened when there was “pogonip.” The Indians called this condition the “White Death.” It occurred usually after a severe snowstorm followed by extremely low temperatures. 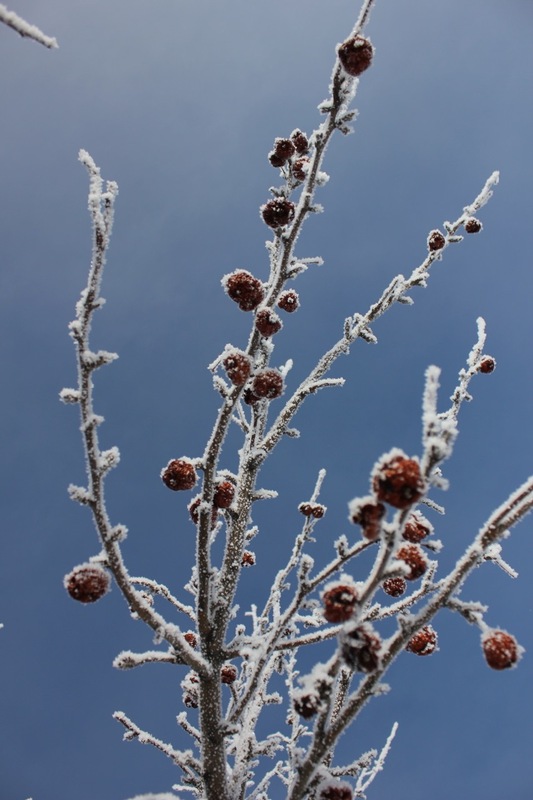 The high humidity created an icy fog that clung to trees, sagebrush and other flora. Anyone breathing the icy crystals was exposed to a terrible respiratory ailment that sometimes caused death. A woman having a child during the winter months had to be able to care for the child and travel with the clan when spring came. A shocking reality happened when twins were born: The woman was expected to kill one of the children in order to be able to care for the other. When the first white explorers came into the region, a common remark seen in their diaries was the fact that the Indians wore very little clothing, even in the winter. The natives had become so accustomed to the severe conditions that they simply did not need the amount of clothing their white counterparts did. All this and more is described in detail in my book about the Spirit Cave Man, titled Legends of Spirit Cave. In this exciting prehistoric novel about the ancient Nevadans, you can get a true feeling of what life was like for these people thousands of years ago. IMITATION ROCK ART FOR SALE: $40-$50, depending on size, complexity and quality of design. Local delivery within 30 miles of Carson City, Nevada, for additional $10. Small rocks also available. For many years, I was a construction inspector for the Nevada Department of Transportation and for several consulting engineering companies providing inspection services on highway construction projects. This vocation took me to nearly every town in Nevada and to the surrounding states as well. Sometimes, out of boredom while waiting for the next load of pavement to arrive, I would gather a few of the chocolate-colored boulders covered with desert varnish that could be found alongside the highway. 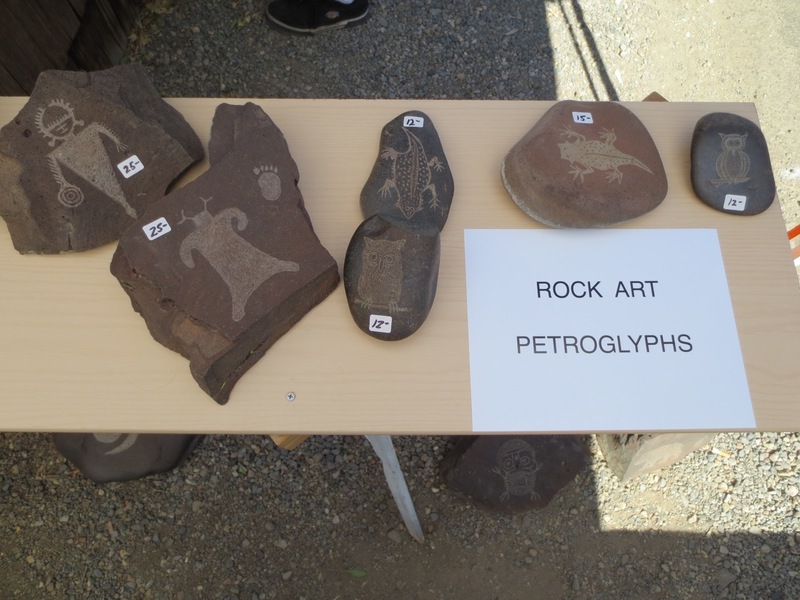 The designs were convincing enough, I could have fooled some of the people they were genuine petroglyphs. I always fessed up that they were of my own creation and more often than not, the guys I showed them to offered to buy them from me. 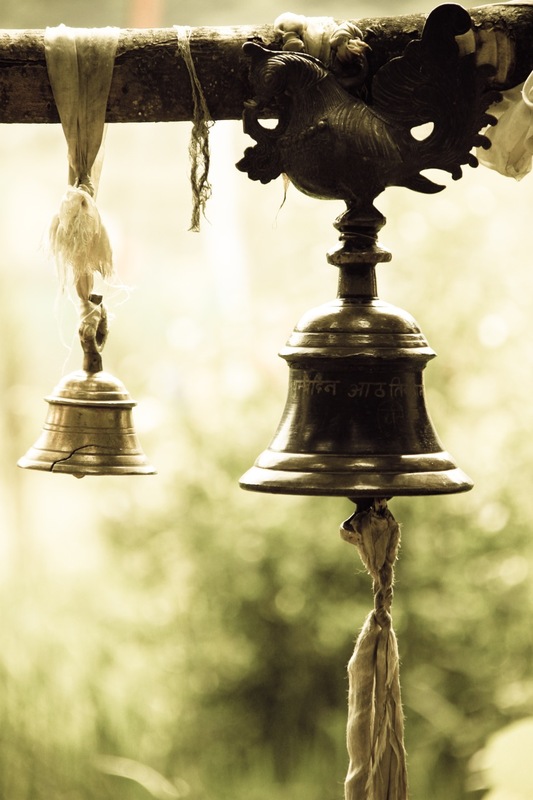 The attraction of owning one of these creations is to set it in a strategic location in your yard where visitors might think they were the genuine article. 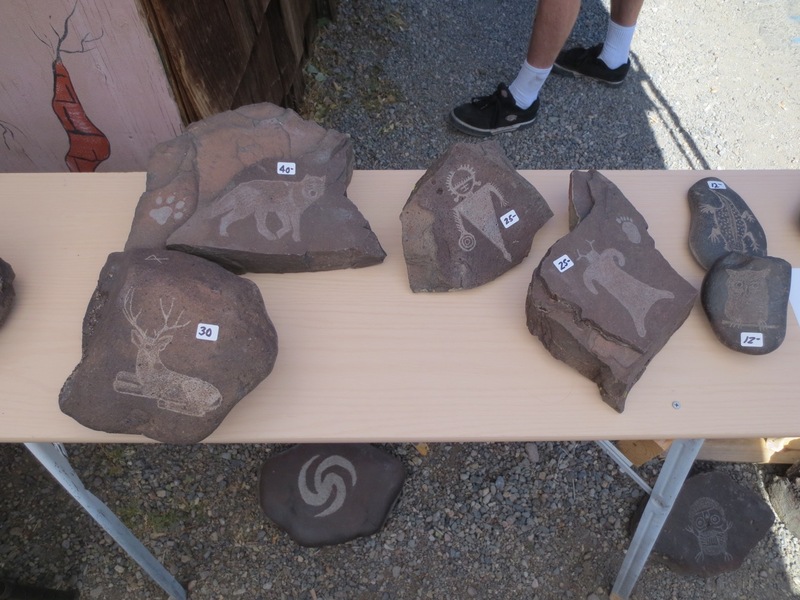 I estimate I have made and sold hundreds of these imitation petroglyphs and given many others to friends and relatives. I never had a craft show, garage sale or yard sale where I did not sell out my entire inventory of rock art. I have searched the various petroglyph sites to find interesting designs of petroglyphs from many sites around the American West. Some of the designs by the early native Indians were truly works of art. Some may seem crude by modern standards but they reflect the imagination and talents of hunters and craftsmen from hundreds and thousands of years ago. In a previous article, I told about the various types of petroglyphs that can be found in the few remaining places where we can still go to see them. In addition to the unexplained images of spirals, parallel lines, zig-zags and curved lines, there are hundreds of other more recognizable images. Some of my favorite subjects are human images of warriors, shamans, and ghost-like semi-human creatures. Others seem to depict galaxies and even space craft-like conveyances. What inspired the creators of these type of images is anyone’s guess. Animal figures drawn by the ancient hunters are always interesting topics. I have seen hundreds of images of deer, elk, bison, bears, lizards, bighorn sheep, mountain lions and other creatures drawn by the ancient hunters. It seems they liked to display the animals they hunted either as a wish for a successful hunt or as a way of displaying something they had actually taken. 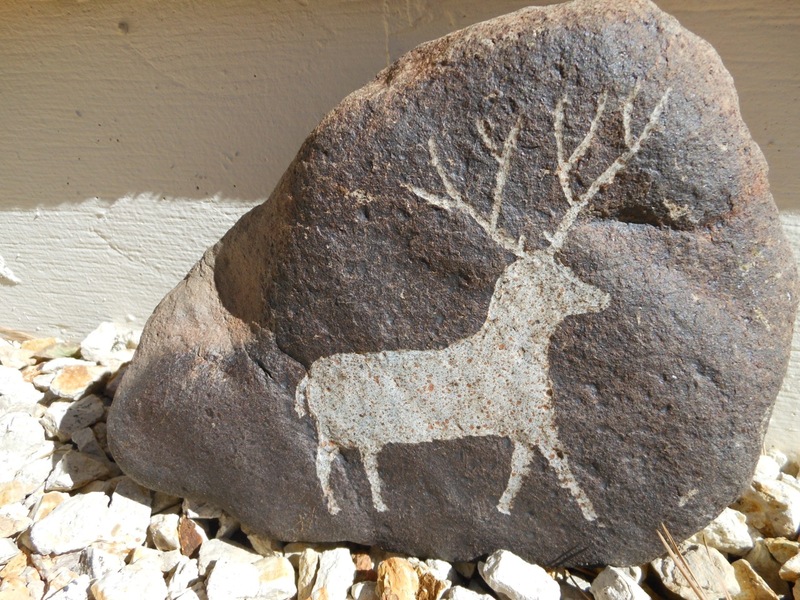 I have considered going into the business of selling my petroglyph art work on a large scale to people who would appreciate an interesting depiction of art from our prehistoric past. A limiting factor to this venture is the logistics and cost of shipping a heavy boulder and still keeping the price within reason. If prehistoric rock art is of interest to you, please contact me using the form below. American Indian rock art found on boulders covered with desert varnish at the Grimes Point Petroglyph site east of Fallon, Nevada. Throughout Nevada and other places in the American West, examples of American Indian rock art, otherwise known as petroglyphs or pictographs, can be found. 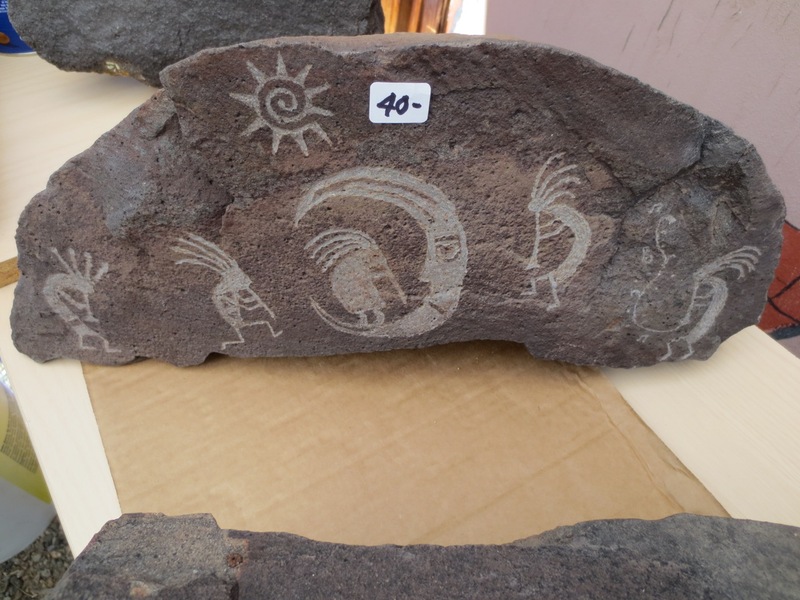 Petroglyphs are images that are carved, pecked or scratched into the surface of a suitable stone. This can be as simple as grooves etched or scraped into the rock to create a desired image, or it can be done on rock surfaces covered with a brown or black coating known as “desert varnish.” This method reveals a lighter color of rock beneath the thin coating of the rust-colored desert varnish. Important: Please do not touch petroglyphs or pictographs, as this can cause irreversible damage. Also, be sure to stay on designated trails. Desert varnish is a complex chemical reaction that occurs over a long period of time when moisture, dust, manganese, iron and other elements stain the surface of stones, boulders and rock cliffs in a desert climate. Most of the petroglyphs found in Nevada have been drawn on surfaces having desert varnish. Modern people have attempted to decipher or speculate on the meaning of these images. Despite these efforts, the true meaning of most of these remains a mystery. Another type of rock art is called pictographs. These are created when the artist uses stains of natural materials to paint an image on stone. These are usually found only in caves or sheltered locations where the dye or paint cannot be easily washed away. There are several types of petroglyphs and pictographs. Those with geometric patterns of wavy lines and circles are called the curvilinear style. Rock art with straight and parallel lines in geometric patterns are called rectilinear style. Both of these can be found at the Grimes Point petroglyph site east of Fallon, Nevada. Rock art representing animals can be found at many sites in and around the Great Basin. These can show bighorn sheep, deer, lizards and other animals. They are called zoomorphic images. Any rock art showing images of human figures, shamans or imaginary human-like creatures are called anthropomorphic images. The question always arises of how old the rock art images might be. This has been one of the most difficult questions to answer with any accuracy. We do know that images showing the use of the atlatl or throwing stick are likely over 1,500 years old. Representations showing figures using the bow and arrow are more recent and are likely less than 1,500 years old. Occasionally, pictographs with organic binders in the pigments can be dated with the radiocarbon method. Relative age can sometimes be determined by the amount of desert varnish that has covered over the images since they were originally made. 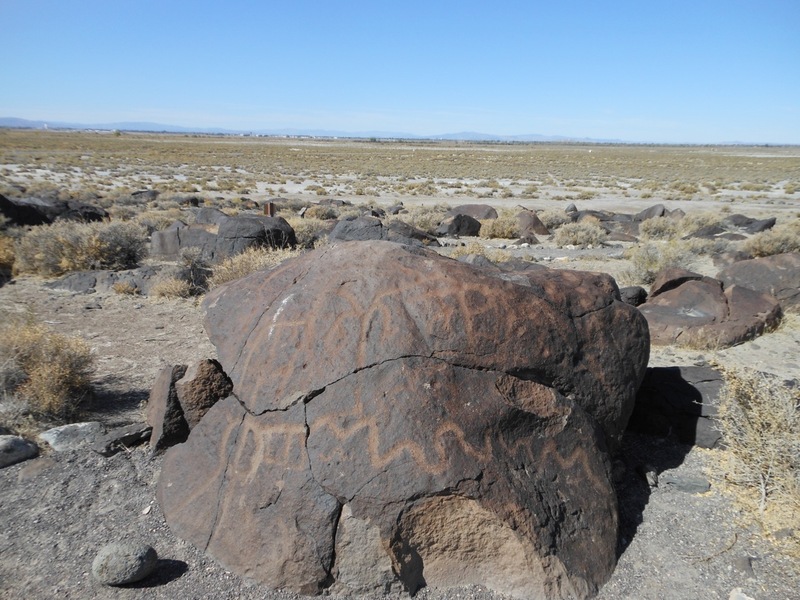 Recently, petroglyphs in the Winnemucca Lake area were determined to be about 14,000 years old. from Reno and Sparks from I-80 east at Lockwood and traveling south on Canyon Way. 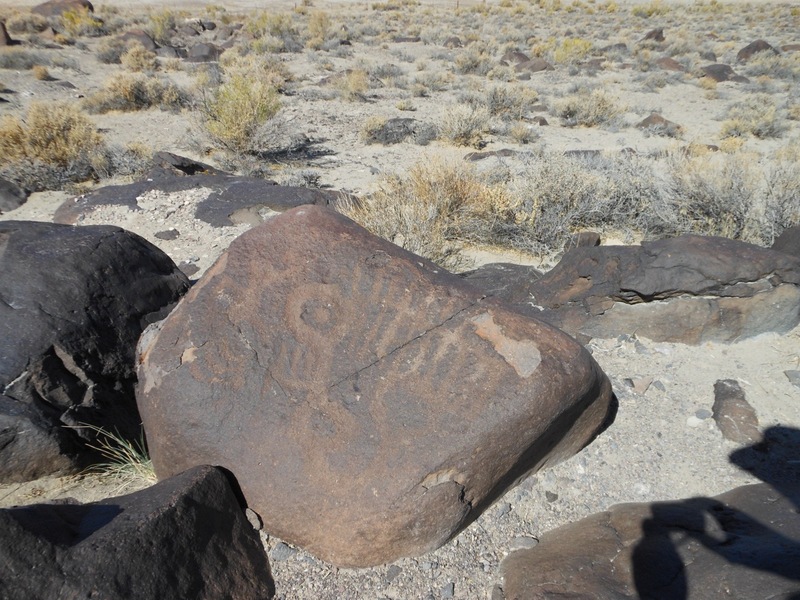 Another popular site nearby is the Grimes Point Petroglyph site a few miles east of Fallon, Nevada just off US-50. There are petroglyphs in the Peavine Mountain area, Pyramid Lake, Winnemucca Lake and several other scattered locations around western Nevada. It is best to get a map of the area you wish to visit and follow a few basic rules of rock art preservation. I have seen many petroglyphs while on hunting trips around Nevada over a period of many years. One of the sad things about the petroglyph sites available for us to see is the damage that has been done to this valuable prehistoric resource by thieves and vandalism. Please do not even touch the petroglyph images when you visit these sites. People have damaged many of the carvings with spray paint, firearms, chalk, oily hand prints, graffiti and even careless footprints. 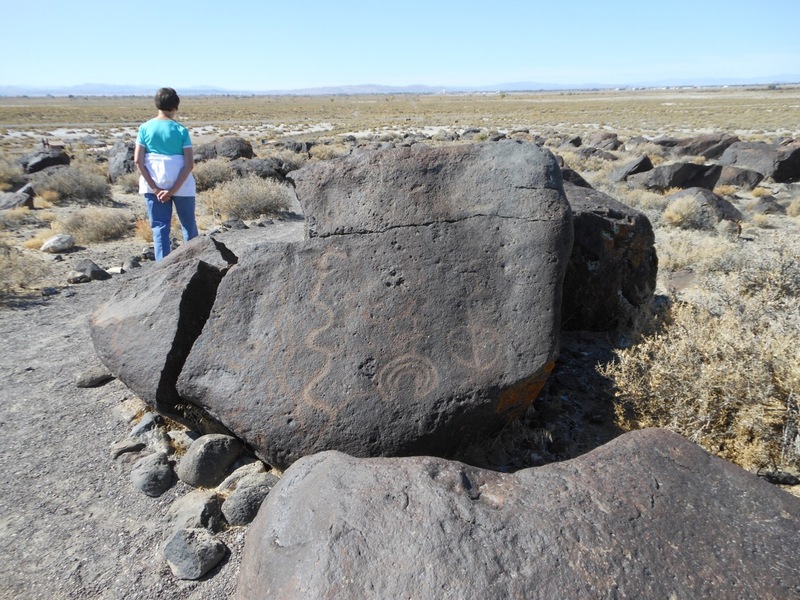 The Nevada Rock Art Foundation has taken up the task of helping to preserve the many rock art sites in Nevada. They have stewards who visit the sites on a regular basis and report vandalism and damage to the authorities when it occurs. 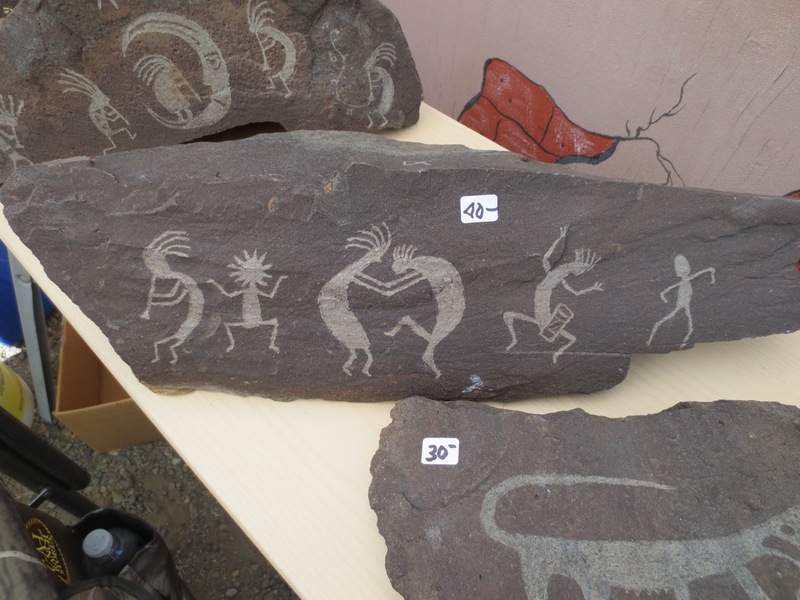 Several people have been prosecuted for stealing or damaging petroglyphs found on public lands. Feel free to take all the pictures you want, and please stay on the designated trails when visiting a site. It can be an enjoyable experience seeing the amazing art created by the people who inhabited the area hundreds and thousands of years ago. Stay tuned for a surprise! Every fall for hundreds of years, the local Indians made their annual trek to the hills in search of the pine nuts that were a necessity for their sustenance. 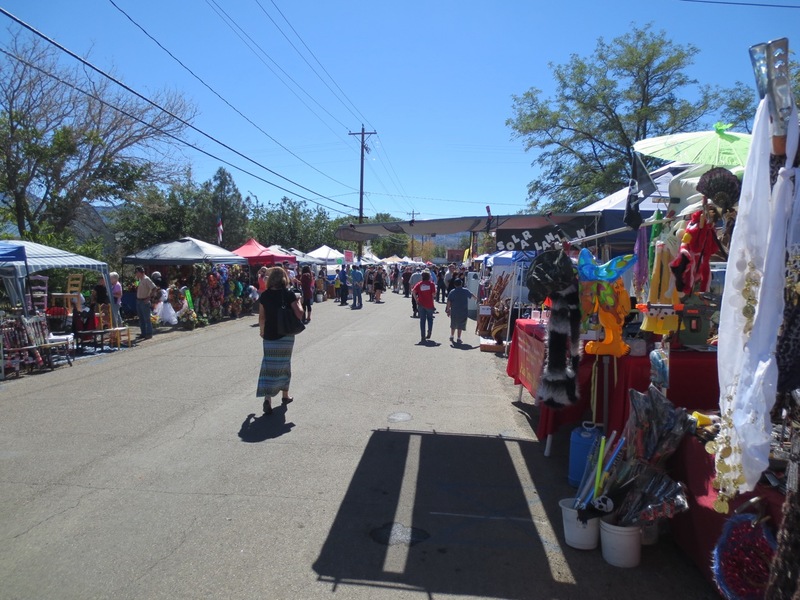 The various tribes, including the Washoe, Paiute and Shoshone, set up camps in the areas where the gathering was most productive. For several days each fall, they combed the short, single-leaf pinyon trees (Pinus monophylla) to gather the pitch-covered cones and extract the plump, nutritious nuts. The traditional way the nuts were prepared by the Indians was to hull them with a flat stone, winnow away the shells and then grind the nuts into a paste, which they used to make a thick soup. They also ate them raw or roasted, which enhanced the delicious flavor. Following the discovery of silver in the Comstock mines and the increased demand for timber and wood products, the stands of native pinyon pine practically disappeared. The Indians soon were without one of the staples of their existence. No longer were they able to gather enough of the rich, nutritious nuts to survive the cold Nevada winters. They became more and more dependent on jobs they found working for the same white men who had destroyed the pinyon forests. After the Comstock boom entered a decline, the pinyon forests began a gradual natural reforestation. Today, there are many thousands of acres of fine, thick pinyon and juniper forests in the lands where they once grew abundantly. This includes the immediate areas around Geiger Grade, the truck route toward Dayton and the Como hills. The pinyon forests are thriving in all traditional areas except where periodic fires have destroyed them or the Bureau of Land Management practice of “chaining” the forests have destroyed some sections. Chaining is the process of dragging a long section of ship anchor chain between two Caterpillar tractors through a forested area. This is done to tear out the trees to make the land more suitable for livestock. It is highly questionable whether or not this method works at all. There are many traditional ways of gathering the nuts. Once promising trees are found, gatherers can pick the nuts off the ground if the cones have opened and the nuts are falling out. This can be made easier if long poles are used to knock the cones to shake the nuts loose. Some people spread tarps or blankets under the trees to facilitate picking up the nuts. If the cones have not opened yet, the task is more difficult. The cones must be taken from the tree and pulled apart to reveal the dark brown nuts in pairs beneath the scales of the cones. This method quickly results in pitch-covered hands, fingers and clothing. The pitch can be removed with Crisco, baby oil or turpentine. I carry a small plastic bottle of baby oil and a few rags so I can clean my hands every few minutes. Sometimes the nuts are small, and other times they are plump. Only the dark brown ones are good to eat. The light tan ones usually are dried out and hollow. They can be separated by floating off the hollow ones in water after you get home. We usually sprinkle salt over the wet nuts and bake them on a baking sheet for about 15 minutes. You can tell when they are done by the intense pine smell or when they pop. In modern times, the white residents of the area have joined the Indians in the annual hunt for the prized pinyon nuts. Not every area will be productive every year. Some years will be more productive than others. Usually, there will be at least one area around the state where pine nuts can be found in a given year. 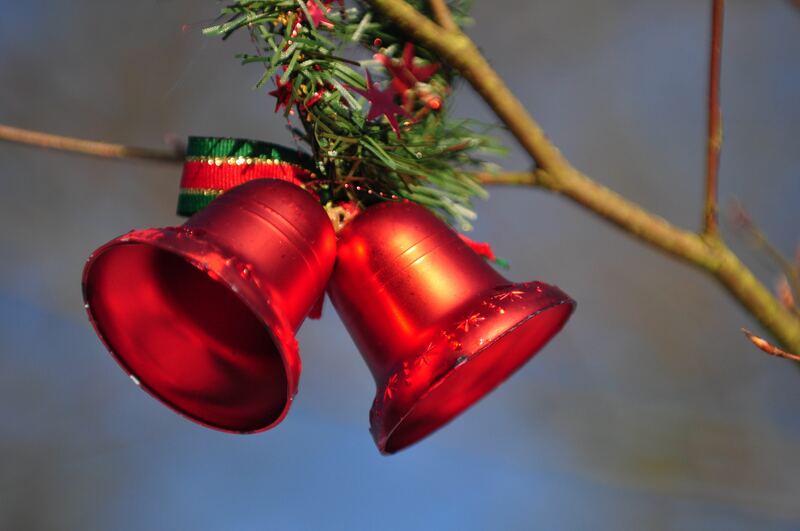 Years ago, I remember gathering the cones from the trees along Geiger Grade and putting them in burlap potato bags. We took them to the then-active steam vents at Steamboat Hot Springs and placed the bags of cones in the hot steam. The steam melted the pitch, roasted the nuts and opened the cones so the nuts could be removed easily. Archaeological evidence shows the Indians of old used similar methods. At Anchor Storage along U.S. 395 just south of Steamboat, there is a huge boulder the size of a large SUV. You can drive up to the office and look at the boulder. It is the largest Indian artifact I have ever seen in Nevada. The top of the boulder is covered with several smooth metate-shaped indentations where Indians ground their pine nuts for centuries. The people at the storage facility don’t mind if you stop to take a look. The old Italian families had a favorite pesto recipe for using pine nuts. My wife still makes pesto with fresh basil, garlic, parmesan cheese, salt, olive oil and, of course, pine nuts. This is blended into a paste and used as a pasta sauce or as a spread for pizza or on French bread. It just isn’t pesto without the zesty flavor of pine nuts. (1.) The weather has been too hot or too cold. (2.) It is too early or too late in the season. (3.) The birds, squirrels or chipmunks ate them all. (4.) There has been too much or not enough rain. (5.) The Indians beat us to the best areas. (6.) Or, my favorite: Let’s buy them at Raley’s for $12 per pound, because it will be cheaper in the long run and we won’t get pitch all over everything. A pestle is a long piece of stone intentionally shaped to be used in a bowl-shaped piece of stone called a mortar. Between May 2008 and January 2009, I was working as an inspector on the section of the Carson City Freeway Bypass from US Highway 50 to Fairview Drive. Before the project began, I attended a public open house of the project site to see the archaeological excavations being performed by the Louis Berger Group, Inc., consulting archaeologist hired by the Nevada Department of Transportation and the Federal Highway Administration. It appeared that the project route passed over a known prehistoric site that included a large Indian village that had been occupied for over one thousand years between 425 AD and 1470 AD. The Louis Berger archaeologists discovered over 150 prehistoric features such as houses, storage pits, fire hearths, roasting pits and activity areas. The site represents one of the largest prehistoric villages ever discovered in northern Nevada. Thousands of prehistoric artifacts were uncovered during the scientific excavations, indicating the various daily activities which the people living there performed. These artifacts included projectile points, scrapers, manos, metates, mortars and pestles. I submitted a resume of my qualifications to help identify the artifacts but my offer was not accepted. Several months after the archaeological field work was completed, construction began on the project. I was contacted by PBS&J Consulting Engineers to be an inspector for several phases of the work. I was told that the Louis Berger Group archaeologists had completed their field work and even though there was a possibility some artifacts may still remain undiscovered, they had sufficient material to complete their report. One of my assigned duties was to inspect the installation of highway lighting components along the freeway ramps north of the Fairview interchange. This included grading, trenching and installing conduits and concrete lighting system footings. Having developed an eye for spotting arrowheads and other traces of ancient habitation, I noticed some charcoal remnants of old fire pits along the west slope of the Fairview exit ramp. As work progressed on the lighting system, I picked up a few broken projectile points and a 4” piece of a stone pestle that appeared to have been broken by excavation equipment. It appeared to have both ends broken off and the breaks seemed to be recently done. I had discovered many fragments such as this in the past and did not consider it of much importance. I put the stone in my toolbox and forgot about it for several days. A stone pestle is a long piece of stone intentionally shaped to be used in a bowl shaped piece of stone called a mortar. The Indians used these tools to grind up seeds, cattail roots and other food items they had gathered. These have been found in several different sizes ranging from a few inches to a foot or more in length. After a few days I found another piece of the same pestle near where the first one was found. This one was about 7” in length and fit perfectly onto one end of the first piece. The amazing thing I noticed about this second piece of the puzzle was the shape of the end, which resembled a male appendage. This surely perked up my interest and I made an all-out effort to find the last piece so I could reassemble the entire artifact. Sure enough, after a few more days of carefully inspecting the slope, I found the third and final piece and was able to connect the three together with stone masons epoxy. The resulting completed artifact was a whopping fifteen and one half inches long and weighed seven pounds. I looked online and found that such artifacts are very rare and are called “Phallic Pestles.” I found several photos of similar items, but without bragging, I can honestly say that none of those shown were as long as mine. Because I found the pestle on state property, I felt an obligation to take it to Eugene M. Hattori, curator of anthropology at the Nevada State Museum in Carson City. Gene was the archaeologist who was called in to excavate the 500 Carson City coin dies I had found at the old mint building back in 1999. He confirmed that the item was a genuine phallic pestle and said that to his knowledge, it was the first one ever reported from Nevada. I agreed to make a donation of the amazing artifact to the “Under One Sky” exhibit at the museum with the understanding that it would be placed on public display and not hidden away in some storage room where no one would ever see it again. The Museum is expanding their Native American display area and the pestle will be displayed when the expansion is completed.